From reconnaissance to communications relay and delivering small payloads, man-portable drones have already proven their flexibility on the battlefields of Syria and Ukraine this decade. Now, defense contractors are jumping into the fray to offer something purpose-built for the U.S. military. Aeryon Defense is one such firm. Its new R80D SkyRaider series of drones is looking to fill the gap designers see in the small unmanned aircraft system market. SkyRaider is designed for vertical takeoff and landing, offers a small footprint in the field, an open architecture and powerful artificial intelligence computing to track targets, as well as the ability to deliver payloads up to 4.4 pounds and provide persistent overwatch for friendly forces. The drone was shown publicly for the first time this spring and made the rounds this week at the Association of the United States Army conference in Washington, D.C.
“We localized this product for the U.S. Department of Defense,” Mark Holden, Aeryon Defense’s director of defense solutions, told Army Times. “We wanted it to be modular, we wanted it to be man-portable, we wanted it to rugged and we wanted it to have some legs in the technology space, meaning that for many years we could continue iterating on it with non-material solutions." That means continuing to upgrade the SkyRaider’s software and internal capabilities over time, rather than burdening the Army with a system that will be obsolete in a year. There's also a version of the drone-killer device that is attachable to an assault rifle. The SkyRaider can be controlled from simple tablets troops would carry with them downrange, and sometimes already do in order to help with close-air support. It’s important to note that Aeryon Defense is offering a military-grade design, built with peer-level adversaries — not simply insurgents — in mind. “Survivability in a near-peer, contested, electromagnetic environment is the backbone of the flight management system of this aircraft,” Holden said. The SkyRaider’s payload off the factory shelf is loaded with cameras. It operates a 60x optical zoom camera that puts up to 20 megapixels on target. “It is the highest grade zoom camera in a man-portable [unmanned aerial vehicle] on the market right now,” Holden said. In the end, the SkyRaider tries "to push the capabilities we would normally find at a theater-level asset, and drag that down to the end-user,” Holden said. By handing more capability to ground troops, SkyRaider also blends well into the multi-domain battlespace Army leaders see as the future. 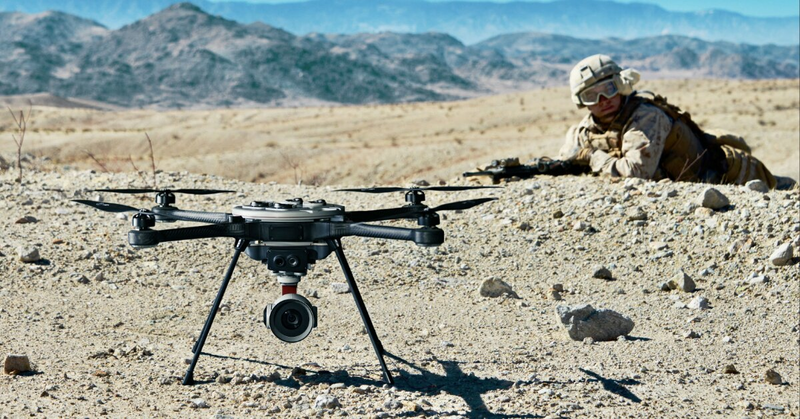 Portable drones fielded by ground troops provide a stable link to their commander back at headquarters, and offer more opportunities for information sharing and intelligence collection. “Integrating this into the loop is kind of a middleware [a software glue] in between them to help enable the operators and tactical end-users on the ground,” Holden said.